Well, after diagnosing that I did in fact have a water pump leak (the one spot I couldn't actually SEE was the spot which was identified as being where the water pump would intentionally seep from if there was a seal failure), I obviously had to tackle the job of replacing the one I had. I elected to do a rebuild rather than buy a new pump (the cost of the new pump alone convinced me of that - about US$450). For the record, the dealer wanted about US$1000 for the water pump work - not inclusive of other work which I intended to do while I was in there. While in dealing with the pump, I'd get an opportunity to address various other things up front which needed to be done - replacing hoses and stopping the advance of rust. As I do not presently have a garage (well, the thing on my house they call a garage isn't even suitable for the Buick parts car I stored in there at the time), or a driveway for that matter, I had to drive the big cat to the location I typically do my major automotive projects: in front of the industrial park unit my father's cabinet shop resides. It is a bit annoying not to be able to work on it at home, but doing the work there comes with perks - two of his neighbours have things which often come in handy -- one neighbour is an electronics repair shop specialising in ultrasonic cleaning tanks (good for little bits), and also has several presses (useful for pressing on water pump bearings, impellers, and pulleys), while another neighbour runs a plating shop and has a bead blasting booth (a must-have for dealing with rust removal). Due to other scheduling things (hereinafter referred to as "work"), I didn't get started until about 1 pm on the first two days, and rain set in towards the end of both of the latter two. I also made several parts runs looking for appropriate replacement nut-bolt hardware for some things (stainless of course!). In all, I spent about three days doing this project, though it should really have taken one if conditions were right and I was prepared with all the parts. I started on 12 APR 2000. Keep in mind - I wasn't just going in and replacing the water pump - I was mounting an assault on oxidization on some parts as well as rebuilding the pump (vs. just installing one straight out of a box). Many of these photos are organized in a different order than they were taken, to present related subprojects together - so don't be alarmed if you're looking at a picture showing the removal of a part and a few "steps" below it, that part appears to still be in place. 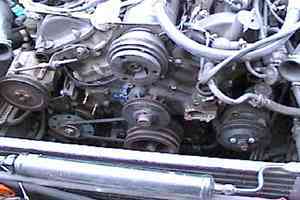 The parts for the project. 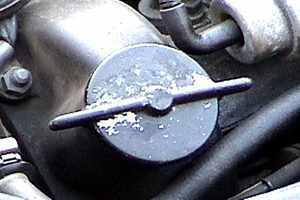 Removal of the grille and bonnet, as well as a suggestion for replacement of the screws with stainless allen-head hardware. 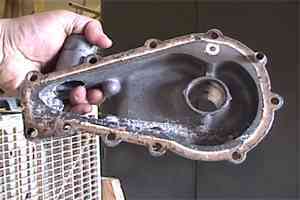 Shots of the radiator showing crud and fin rot. I addressed oxidization on the radiator crossover plate and AC dryer clamps by beadblasting them, and repainting them. 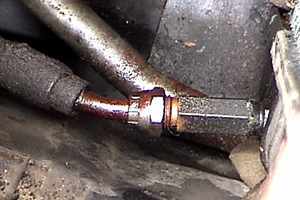 Draining the Radiator via the Banjo bolt (versus just disconnecting the lower rad hose and dumping it all out on the ground), requires a couple of easy to get components. 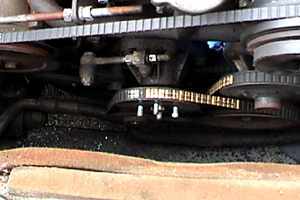 Removal of the Radiator Crossover Plate and related hardware. While in there, attention to the Grounding Points would be a good idea. 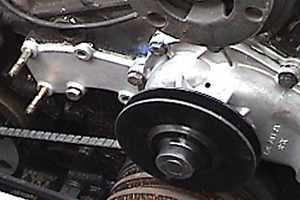 When reinstalling the crossover pipe, I elected to perform a modification to it, which greatly simplified reinstallation. The first day consisted of removing the bonnet, addressing rust on the radiator cover plate, draining the radiator, disconnecting the wiring harness and hoses at the top of the radiator, removing the radiator and fan shroud, followed by removal of the pump. Doing the job by oneself doesn't afford many opportunities to make recordings during the process, since your hands are perpetually covered with crud you do not want getting on your camera gear. Since the cat was outdoors, at the end of each day, I had to replace the bonnet before I'd go home. If you don't have anything else suitable, take a few wooden dowels and give them a taper. You can stuff the tapered end into vacuum lines or trans cooler fittings to keep crud from getting in, and keeping the fluid from dribbling out. A rubber bootie is even better. A square of cellophane with a wiretie (I use the releasable variety, but a plain one will work just fine) works quite good. 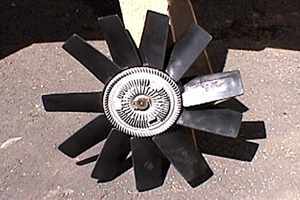 The fan clutch is affixed to the fan pulley with 1/2 inch nuts. If you need to chase them, they're 1/4 inch studs, though I can't recall what thread count. While it was out, I thought it'd be a good idea to take a shot of the newer style clutch fan - I replaced the original about a year and a half earlier, after the original clutch bearing seal went south. This plastic fan is much more pliable than the original, and in my experience, the black plastics tend to be better behaved with heat and UV (not that there's a lot of UV under the bonnet). 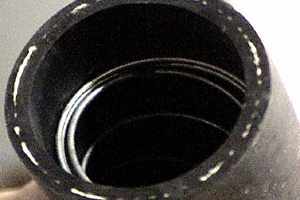 Transmission cooler fittings are 3/4 inch. This is what I was greeted with after removal of the radiator. What a messy looking water pump! All the bolts are 1/2" heads. This day, I dealt with cracking the pump halves apart (needed a second pair of hands to do this as it required application of heat while prying), thoroughly cleaning the pump, rebuilding it, prepping the pump gaskets with Permatex 2B, and reinstalling it. Shortly after reinstalling the pump, I realized I should replace the hoses on the crossover, but the parts stores which were open did not have the appropriate hose, and the one which would have (and did, the following morning) closes earlier than the others. Called it a day. 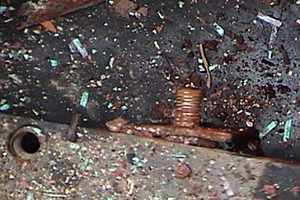 After removal of the pump and splitting the halves apart (CAREFULLY), this is what I was presented with inside. Scale marks from what would probably have been an extended period of disuse sometime before my purchase. 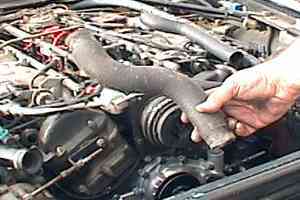 The gasket, too, is an anoying thing to deal with in the traditional way. After a visit to the bead blasting booth, this pump probably looks nearly as good as when it was first manufactured. 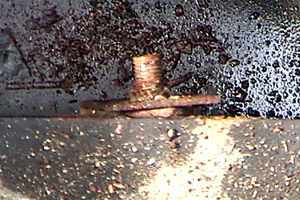 Water pump bolts on the A and B banks. 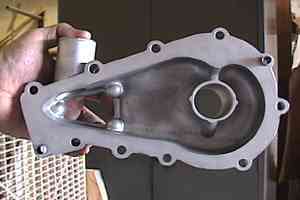 By the way - the pump IS NOT painted here, this is what a nice clean aluminum part looks like. Pump is installed, and the fan pulley is mounted in place. Compare with a similar shot taken at the end of Day 1. 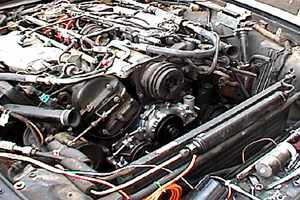 View of the engine bay with air pump and power steering adjusters before the crossover pipe reinstall. 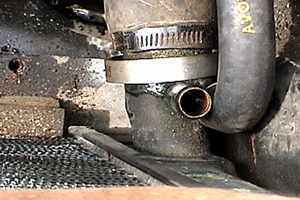 Water pump inlet installed with gasket. Expansion tank - a project for another day. After purchasing the bits of hose for the crossover reinstallation, I decided that the crossover was a real PITA to get reinstalled (ESPECIALLY with premium reinforced hose), so I opted to make a modification to the crossover pipe by cutting it in a strategic location. After reinstallation, I realized I could have been just a bit more strategic, but nonetheless, the mod worked. Reinstalled the radiator and fan shroud, reconnected hoses and electrics, then refilled the radiator with the appropriate 50:50 mix of coolant and water. Words cannot describe the experience of turning the ignition key and letting the engine warm up and not finding coolant to be dumping out of anywhere. 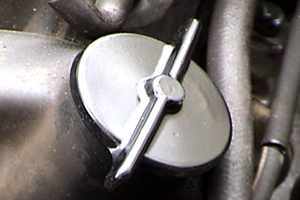 Chase both of the fan shroud studs. 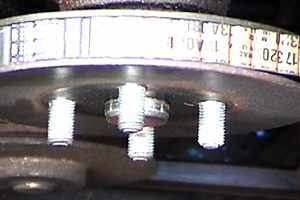 These are 1/4 inch NF-28 thread (7/16 inch nuts). These were mildly annoying to get the washers and nuts back onto when I had the radiator and fan shroud back in place, primarily because I had not jacked the car and was going entirely by feel. 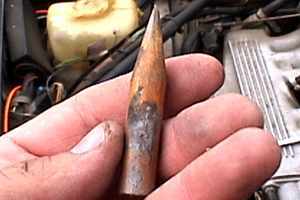 Apply anti-sieze to them when you go to reassemble (with will afford some corrosion protection). Note all the debris from the radiator. 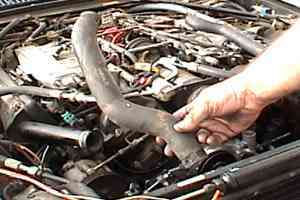 The anti-collapse spring in the lower radiator hose. 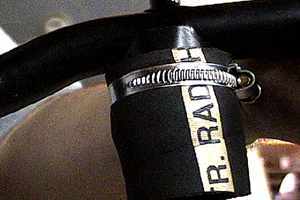 This is part of the hose, not a modification by me. 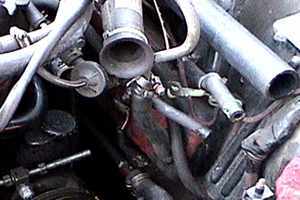 The hose is a Dayco 71483. 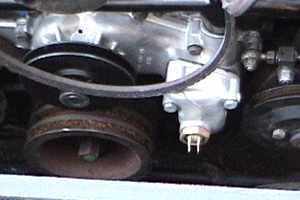 I used gold-stripe hose for the crossover-to-water pump. This is about 2 3/16 inches in length. 2 inch OD, 1 5/8 inch ID The upper hoses are about 2.5 inch in length, 1 3/8 inch OD, 1 inch ID. 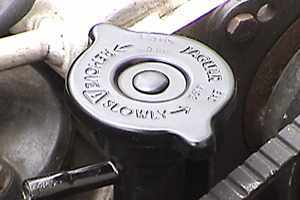 Oil filler cap - original. Here are the refurbished oil and coolant caps. A bit of bead blasting (with thorough cleaning before and after - esp of the oil cap -- I cannot stress how much you do not want to introduce blasting media into the engine - ESPECIALLY VIA A TOPSIDE LUBRICATION POINT), followed by a careful application of a semigloss black paint, and they look almost like new, even if the coolant cap wasn't originally painted. My friend with powder coating gear (the same one with the bead-blasting booth) didn't yet have the electrics run for his oven for the powder coating. 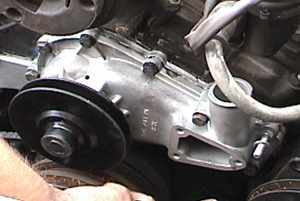 Guess what project I took on shortly after I finished my water pump restoration? 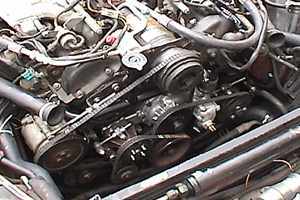 All engine belts back in place and properly tensioned. 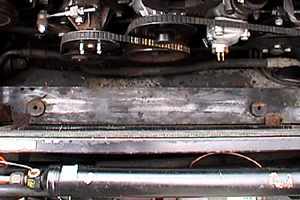 Transmission cooler lines are 3/4". 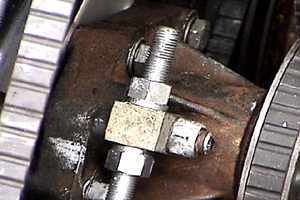 REMEMBER: do not overtorque. 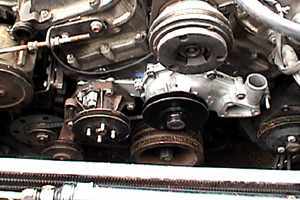 Reinstallation of the remaining parts was pretty much a reversal of the procedure used to remove them. Having dealt with chasing threads and replacing oxidized hardware, the reassembly was considerably easier than the disassembly was. 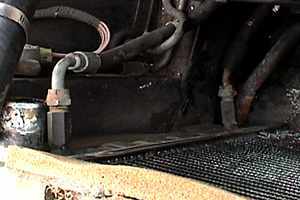 Upper radiator hoses for the A and B banks, respectively. These are the originals, both of which were replaced during this project.